Pets can make you happy! The Louie Ortiz Group is honored to help the Rancho Coastal Humane Society. Please check back with us often as we update the information regularly and check with the Humane Society for availability and more information about the pets. Please call (760) 753-6413. “Koa” is the Pet of the Week at your Rancho Coastal Humane Society. He needs to start the new year with his new family. Koa is a 1-1/2 year old, 88 pound, German Shepherd mix. He was transferred to RCHS from another animal shelter through the FOCAS program. Because he’s such a big and adventurous dog, he’s going to need lots of exercise. Meet Koa at Rancho Coastal Humane Society, 389 Requeza Street in Encinitas or log on to SDpets.org. Call 760-753-6413 for more information or to sponsor Koa until he’s adopted. Kennels and Cattery open 11 AM to 5 PM Wednesday through Monday. Nobody wants to wake up behind bars on New Year’s Day. 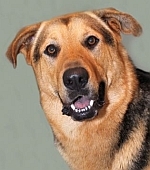 That includes “Koa.” He’s a 1-1/2 year old, 88 pound, German Shepherd mix…and he’s the Pet of the Week at your Rancho Coastal Humane Society in Encinitas. This is a happy, enthusiastic dog that will love you the rest of his life. Koa was transferred to RCHS through the Friends of County Animal Shelters program. While he can make himself at home almost anywhere, his home should have a living room and a couch. Koa is a big dog that loves going for walks and experiencing new adventures. He likes kids of all ages, but his exuberance might be a bit much for smaller children. He needs bigger kids and adults. The $145 adoption fee for Koa includes his medical exam, up to date vaccinations, neuter, and microchip identification. Find out how you can adopt “Koa” or sponsor him until his new family finds him and takes him home. Call 760-753-6413…log on to SDpets.org…or visit Rancho Coastal Humane Society at 389 Requeza Street in Encinitas. Kennels and cattery are open Wednesday through Monday from 11 to 5. Here is a link to the pets you may have missed in previous weeks!